Dogs with longer hair often have sleek, healthy coats when their owners groom them. But even well-groomed dogs may experience trouble with their coats, especially during the summer months when overheating is an ever-present possibility. When owners groom their long-haired pets, they often forget or avoid clipping the feathered area of hair along their legs and near their ears, as these areas are sensitive and hard to reach. Yet with patience and proper technique, it is not difficult to clip the feathered hair on your dog. Choose your clippers carefully. Choose clippers that are not too loud when they are turned on, as they can startle your pet. Lubricate the blades of the clipper and check for the blades' sharpness. Shampoo your dog's fur and let it dry. Comb or brush it out so that there are no tangles or mats. Pay particular attention when combing the feathered hair along the legs, tail or ears of your dog. 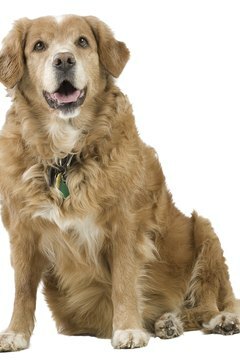 Determine how short you want your dog's feathered fur to be. If you want it to be very short, use a clipper comb with small, closely positioned teeth. If you want the feathered hair to remain longer, use a comb with wider teeth. Attach the comb securely to your clipper. Make sure that your dog is calm and relaxed if your dog has never been groomed with clippers before. Let it get accustomed to the noise and vibration of the clippers. Speak soothingly while the clippers are running. Let the clippers gently rest against the dog so that it learns not to run from the vibration. Run the clippers along the feathered hair of your long-hair dog. Move the clippers so they run with the direction of the growth of your dog's hair to prevent the clippers from injuring the dog. Move the clipper in long, smooth motions across the hair. If the clipper gets too hot while you are using it, stop, let the blades cool and add coolant or lubricant to the blades. Hot blades will make the clipping process uncomfortable for your pet.